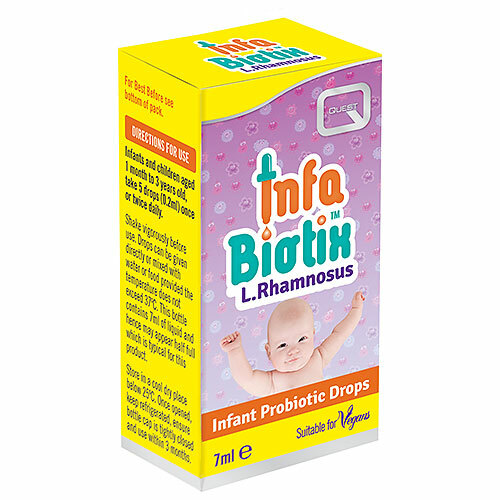 Quest InfaBiotix contains Infant Probiotic Drops which are a stable liquid probiotic supplement for infants and children, containing l.rhamnosus. Suitable for infants and children aged 1 month to 3 years old, take 5 drops (0.2ml) once or twice daily. Drops can be given directly or mixed with water or food. Drops can also be mixed with milk or formula provided the temperature does not exceed 37°C. Corn oil, lactobacillus rhamnosus, emulsifier: mono-and diglycerides of fatty acids. Below are reviews of Quest Infabiotix - Infant Probiotic Drops - 7ml by bodykind customers. If you have tried this product we'd love to hear what you think so please leave a review. Good probiotic – it’s the GG strain of rhamnosus, which is good for gut health, but also it isn’t a histamine producing strain (as some probiotics) which is great if you've got histamine intolerance like me. The only down-side is it needs to be kept in the fridge, and it goes a bit syrupy and makes it hard to make sure the contents is mixed evenly to ensure a standard dose, each time. But it's not too difficult to work with. Overall would recommend.